Koreans have long salted and preserved yellow corvina (gulbi: 굴비), as a way to make them more delicious and keep them longer. Yeong-gwang, in South Jeolla province, is especially well-known for gulbi and you’ll see large racks of them there, drying in the sun and ocean breeze. They can be found sold frozen in the Korean grocery store, pre-cleaned and ready use, you just need to thaw them out to use them. 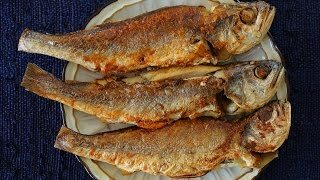 In this video I show you how to make a simple, traditional Korean table setting with pan fried salted & dried yellow corvina and a few other side dishes from my website and cookbook. The cooking time for yellow corvina can vary depending on the size of the fish, but just be sure to cook until both sides are golden brown and crunchy on the outside. My suggested side dishes in the video are traditional cabbage kimchi, mustard green kimchi, steamed eggs in an earthenware bowl, braised soybeans, and braised dried sweet potato stems (in my cookbook only) with multigrain rice and beef and radish soup, but you could choose whatever dishes you like. I chose these because they are delicious and compliment each other, so whatever dishes you choose for your table setting should have a variety of tastes, textures, temperatures, and colors. Thaw out the gulbi over a few hours on the kitchen counter or in the fridge overnight. Use kitchen shears to remove all the fins, then clean gulbi with a moist paper towel or cloth. Heat up a non-stick skillet or frying pan over medium high heat. Add the cooking oil and swirl to coat evenly. Place the gulbi side by side and cover. Cook for 4 minutes until the bottom of each gulbi turn golden brown. Turn them over and cover. Let them cook for another 4 minutes. Turn them over and cook for a couple of minutes with the lid open. Turn them once more and cook for a couple minutes, until all sides are crunchy and golden brown. Total cooking time for a 9 inch gulbi will be around 12 minutes (4 minutes + 4 minutes + 2 minutes + 2 minutes) over medium high heat. Transfer the gulbi-gui to a serving plate. Serve right away with rice and more side dishes. Posted on Tuesday, May 17th, 2016 at 10:34 pm. Posted April 30th, 2018 at 10:32 pm | Log in to reply. This recipe was so easy and tasty with no added seasoning. Thank you for giving us the confidence to try ingredients and recipes we never imagined were possible! Posted June 24th, 2016 at 5:11 pm | Log in to reply. Thanks so much for uploading this video. It’s definitely on my to buy list when I visit Korea. Hope you can upload more videos on other dried seafood too. the flesh at the bottom. The bones pretty much stays intact. Flip over and do the same. – or, make straight cut from tail to head at the middle of the fish… dividing it horizontally in the middle. Pretty much following the anatomy of the fish. Much neater and easier to search for specific bones. Posted May 21st, 2016 at 9:23 pm | Log in to reply. Posted May 22nd, 2016 at 9:22 am | Log in to reply. This recipe was originally posted on May 17, 2016 at 10:34 pm by Maangchi. The video was watched 601,552 times on YouTube & has 10,165 likes!